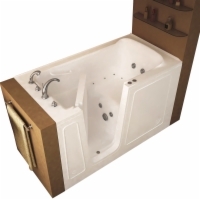 The Large Duratub from Sanctuary Walk-In Tubs fits perfectly in new construction or when used to retro-fit existing bathrooms because it measures a full 60", the standard tub length. It also features acrylic construction that stands up to chips, scratches, and stains over years of use. A stainless steel frame and leveling feet are standard.